Photos by Kevin Fickling and Sayer Danforth courtesy of SICKBOAT Creative Studios. If you missed The Draculas at work during Pow! Wow! Long Beach last week, it was probably because you were comfortably asleep. 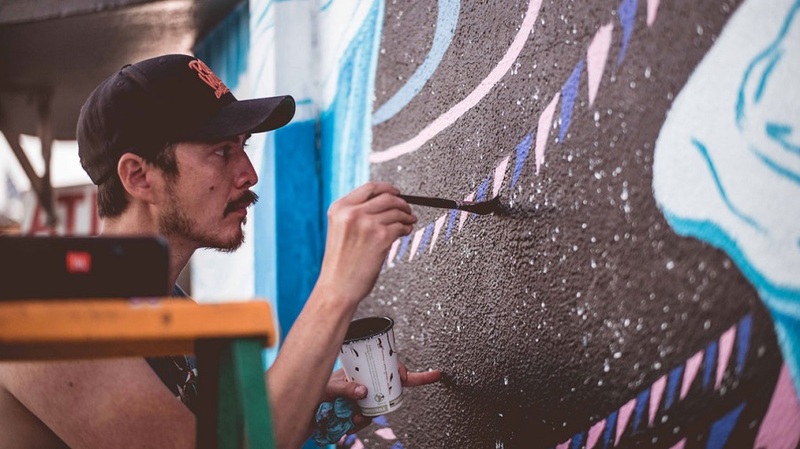 Most often painting late into the night, the Long Beach-based duo comprised of artists Jeff McMillan and Gary Musgrave avoided the sun to complete not just a mural, but a story worth contemplating. 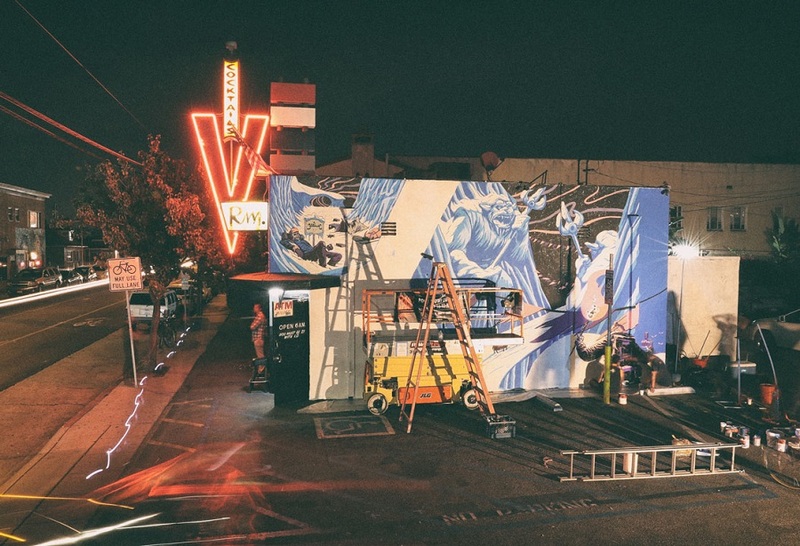 The monstrous yetis and journeying hikers now apparent on one of Long Beach’s most popular dive bars, the V Room, might stop a passerby or leave a buzzed bar patron puzzled in the parking lot. It’s all about creating more than just a pretty piece of art, one that leaves the viewer with a little more to think about, McMillan said. Filmmaker Scott Nichols of SICKBOAT Creative Studios captured that idea on camera, filming the illustrators in their natural habitat, as well as interviewing a handful of Pow! Wow! Long Beach organizers in a short film released this week. The Draculas – POW! WOW! Long Beach (2017) from Sickboat Creative on Vimeo. The short seeks to shine a light on how public art is helping to reshape the fabric of the city’s social, cultural and local environment, explained Nichols. One pleasantly surprising facet of the film involves McMillan and Musgrave magically appearing and disappearing at different points of the mural site. They’re not just painting a wall anymore, but showing up in a way viewers would least expect. The vision for the film was to create a positive narrative about how “we can shape both the current and future generations of Long Beach,” directly helping the progression of “public art as a means of positive change,” Nichols said. Artist and Cal State Long Beach art professor Gary Musgrave working on the mural. Learn more about SICKBOAT Creative Studios here. For more info on The Draculas, check out their Instagram @thedraculas. The V Room is located at 918 East 4th Street.